Nestled in Santa Barbara County’s beautiful wine country, Chumash Casino Resort is truly an adventure in escapism. 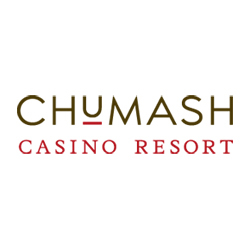 Chumash Casino Resort’s main attraction is its world-class gaming floor that is open 24 hours a day, seven days a week. With 2,000 of the hottest slot machines, dozens of table games, bingo, Free Play and weekly luxury car drawings, guests are sure to find gaming entertainment that fits their every need. While visiting the wine country, enjoy a luxurious stay at Chumash Casino Resort Hotel. The AAA Four Diamond property features 106 spacious guestrooms and 17 luxury suites. Its award-winning spa offers a wide array of relaxing beauty and restorative treatments. Three restaurants at Chumash Casino Resort feature casual to gourmet dining. The Resort’s fine dining restaurant, The Willows, has received Four Diamond ratings for excellence for nine years in a row. For some of the region’s best entertainment, guests head to the Resort’s Samala Showroom.